Visual presentations are so important, not just for first impressions, but to set a theme and tone. The demo for Ghost of Tsushima stuck out to me this E3, especially with a few truly breathtaking moments as the scenes flowed like art in motion, combining color, nature, and human movements into something inspired. The team at Sucker Punch took some time to break down the demo and discuss where their inspiration came from not long after. “As Cinematics Director I was most excited to work on this shot. When I was a kid, while everyone else was watching The Magnificent Seven and A Fistful of Dollars, I was watching Yojimbo and Seven Samurai. So many of the cinematics in our game are a love letter to Akira Kurosawa,” Billy Harper said. Eagerly awaiting players who want to explore these themes or better understand the tone will find direction in that quote. They will revisit classic films, thus getting a stronger insight into the characters and world, while hopefully seeing some timeless cinema. I have a few suggestions that could help, other than the two Harper mentioned, and I figured series like Lone Wolf and Cub or Zatoichi would be easy to find, as each have multiple films. The selections below, though, could share something new and should also keep the anticipation for the game strong. Kurosawa is a name repeated a lot in a discussion like this, for good reason, and this was one of his most successful films, something not to be missed by movie buffs. It’s a visually stunning film with solid camera work that produces good action scenes. It is the acting that helps a witty script flourish, as the story focuses on a comedic duo of greedy buffoons as they bumble through war and come up with harebrained plans. I loved Princess Yuki in the end, even though she spent the entire movie yelling, but that added to the lightheartedness. On another note, fans of Star Wars should view this movie for the influence it had on George Lucas and that franchise, even though the film is so much more than what it pawned. Though Hidden Fortress may not be considered one of Kurosawa’s best critically, it is probably the most entertaining and certainly easy to watch. This is a true epic based on the real life story of Musashi Miyamoto—or at least his account of it, as told in the tale he wrote, The Book of Five Rings. It’s the beginning of a great trilogy, an origin story that shows the quest of an ambitious man, but put on a path that leads him to becoming a samurai. It isn’t a simple journey, featuring a flawed character that lets his ambition and desire drive him through tumultuous part of Japanese history, beginning with the end of a civil war. This film has an intriguing love triangle, shows the protagonist’s growth, and paces itself well to cover the around ninety minute runtime. It is light on the fighting in comparison to others in the genre, but when it happens, each swing feels important. The movie is considered a cornerstone and was also received well in America, winning an Academy Award for Best Foreign Language Film. I’m breaking the mold in a couple of different ways here, by adding an anime—though there are several good samurai anime series, like Samurai Champloo—and something with ninja clearly in the title, but trust me when I say it fits. The lead character Jubei is more like a samurai in many ways, loosely an homage to a particular samurai folk hero: a ronin warrior who has his own goals, but does good deeds when stumbling into bad situations. This leads the hero into a dangerous world of magic and treachery with unconventional allies, showing audiences many incredible creative fights and hands down some of the best animation from that time. 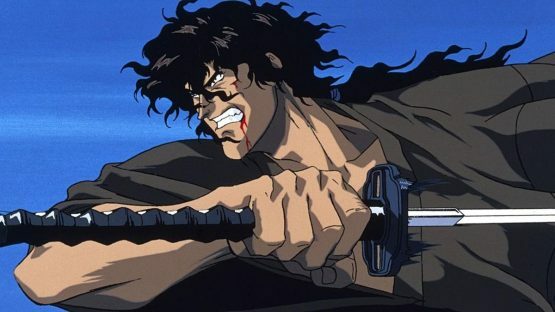 Ninja Scroll is highly regarded and has been cited as inspiration for many films that followed it. Although it is mostly remembered for its unsettling sexual scenes and graphic violence, I think the film holds up, because it’s simply a captivating experience all around. Though it’s a darker tone from what we’ve seen so far in Ghosts of Tsushima, many of the scenes seem relatable and potentially show a similar story that leans more towards the supernatural. As an English major, the idea of taking one of Shakespeare’s works, like King Lear, and giving it a Japanese setting seemed intriguing, but I got so much more the first time I watched it for one of my college classes. 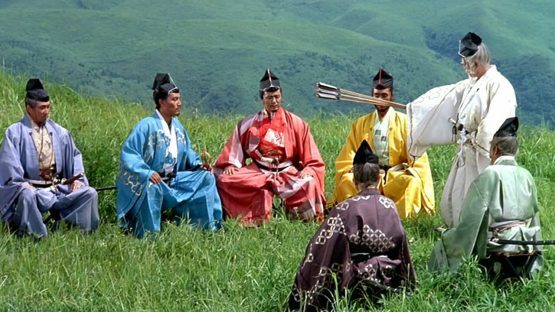 It is considered Kurosawa’s last great epic film, and reading about the struggles behind him making it, the personal heartache he faced, and learning how the world of film was changing at the time, makes the movie mean even more in some ways. It’s a tale about land, power, bloodthirsty men, and the women behind them, with some incredible acting that covers various styles. Characters stand out in personality and flare, while it even won an Academy Award for costuming. It’s the visuals that fascinated me originally, with incredible imagery, varied shots, and a stunning sense of color that are in line with the epic battle scenes that have their own spectacular scope and depth. Visuals, tight traditional storytelling, and operatic performances are why Ran is worth viewing. I wanted to throw something a bit more modern on this list, so why not a film that references—and almost copies in many ways—many of the aforementioned classics and uses their elements to tell a basic but effective revenge story. 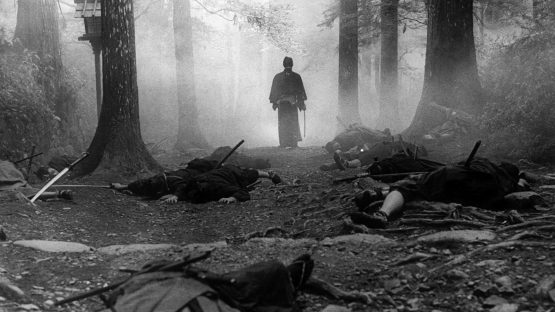 Quentin Tarantino is quite the student of samurai films, so watching a project from him that was supposed to reflect the genre, is a real treat. The focus on artistic style while trying to capture the motif is an experience, and the great characters with their one-on-one duels as well as excellent anime flashbacks is worth revisiting often. There is a focus on the swords as well, talking about craftsmanship and the importance of the weapon, while having the excellent Sonny Chiba as Hanzo. All of these elements are mixed with an incredible soundtrack and tossed inside a classic revenge tale to display how truly epic The Bride’s quest is. Though I prefer the first volume for some great action and brutal slaughter, the second installment is more similar to other movies on this list in some ways, showing more of the tradition it mimics. There are also some amazing shots in this, with good cinematography and superb lighting. Most people seem to ignore these things when discussing black and white films, but here it is hard not to appreciate the natural splendor and produced nature effects like the rain to set the mood. It may be in black and white with only splashes of color, but this film actually came out in 1998. 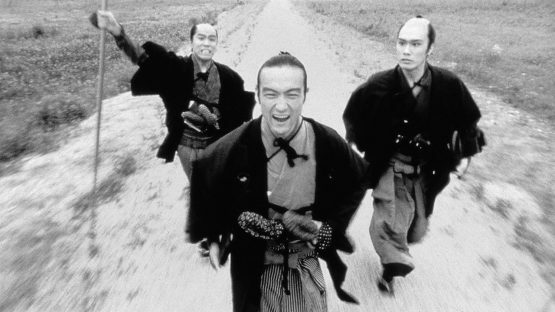 Unlike anything else on this list, Samurai Fiction is a comedy. That certainly may not feel like it will fit the tone that Ghosts of Tsushima is trying to establish, but the film in many ways is an homage to the classics while showing the true core of tradition and still managing to be something different. The movie’s main character goes through a coming of age story, on a mission with two goofy sidekicks, while other characters have plenty of their own backstory and motivation to shine, making for an intriguing tale. Though this is less about the action, the writing is clever and the levity is well-placed, providing the experience with its own unique charm. The rock soundtrack helps the film stand out and its flow as well while still requiring knowledge of the genre to get all of the jokes. As such, it has been billed as a samurai movie for the MTV generation. It may be a satire piece, but there is a serious, straight-faced approach that is gripping. This movie was a must, as it has an intriguing protagonist and feels different from so many other films. Some would call this samurai an anti-hero, but those around him use the word savage—a great swordsman, but hated man, who is slowly falling into a bloody madness. There is a powerful performance from the lead actor, Tatsuya Nakadai, who sells the role and carries intensity with simple expressions and glares. Several lines of great concise dialogue helps this also, but the story can be a bit hard to follow, as it takes chunks from larger texts yet feels like it skips around. It even ends abruptly on a freeze frame, a bit surprisingly in the midst of a cool scene. In addition, the intended sequels never released. Some said this was because the shoot had been considered too violent. The fights are brutal, accented by stunt work and screams that sell the ferocity. One thing that stuck with me was the discussion about the main character’s fighting style, making him standout even further among his peers. This was a fun article to research and a chance to revisit so many great films, but the timing is bittersweet. 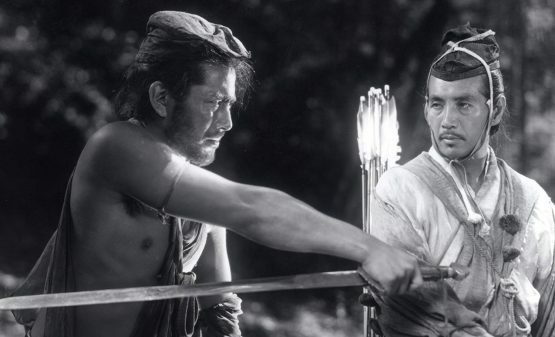 I just read that Shinobu Hashimoto, the screenwriter responsible for so many of Kurosawa’s epics like Seven Samurai and Rashomon, as well as other classic tales, passed away recently at the age of 100. So, now seems like a good to admire the mastery.